Fancy a visit to somewhere different in Central London? 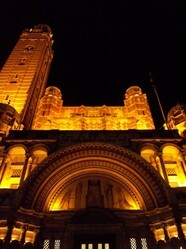 Try Westminster Cathedral, the largest catholic church in England. Westminster Cathedral is the seat of the Archbishop of Westminster, the Mother Church for Roman Catholics in England and Wales. As well as being a tourist attraction, it is a working parish church, and, as such, regular services are held and mass is celebrated throughout the day. The Cathedral was completed in 1903 and is now classed as a Grade I listed building. With its alternate layers of red brick and Portland Stone, it is unlike any other church in the area. Westminster Cathedral lies back off of Victoria Street, London SW1, between Clarks Shoes and McDonalds. There is quite a large paved area in front of it so that you can get the full effect from the road. It is a beautiful building, although pretty new in terms of churches in England. It is built on marshland reclaimed by Benedictine Monks (most of the land around the Victoria Street/Birdcage Walk area was marshland at one time) but it wasn’t used for a church straight away. In the seventeenth century, some of it was sold off so that a prison could be built. There was a prison (Tothill Fields Bridewell Prison) on the site until 1884, when the Catholic Church bought the land. The cathedral, which is the largest Catholic Church in England, is built in the Christian Byzantine style, designed by the architect John Francis Bentley. Building started in 1895 and was completed in 1903. It is a Grade I listed building. To me, the cathedral looks almost like an eastern fortress. The brickwork is alternate layers of terracotta bricks and Portland Stone, an unusual design in the area of London. It’s most unlike traditional English churches, to be honest; I’ve never seen a cathedral like it. Apparently, the archbishop at the time it was built wanted something that would look completely different from the nearby Westminster Abbey (which just happens to be a Church of England church). Inside, it is equally beautiful, with little chapels along both sides of the nave. Much easier if you want to pray than using the nave area, although, to be honest, when there are lots of tourists, there’s not a great deal of privacy anywhere. There are at least 126 different types of marble from around the world decorating the interior - you need to see it to take it all in. Photography is allowed inside the cathedral, except, obviously, during services. Westminster is considered to have one of the best choirs around, and made its first recording in 1907. The choirboys all board at the nearby Westminster Cathedral Choir School, and recitals and concerts are held in the Cathedral from time to time. The Cathedral is a working parish church, and Mass is held over 40 times each week. The cathedral is open to the public and is still free to enter (which is unusual nowadays) but access to the tower is £5 for adults. There is a little cafe in the basement too (the Cathedral Kitchen) where you can buy jacket potatoes, cakes, sandwiches, etc. There is also a gift shop on the ground floor. The Cathedral is only about five minutes walk from Victoria Station. Really enjoyed this article as I love going to Westminster Cathedral. I tend to spend too much in the bookshop next door. Although as Frank says, Westminster Abbey is older, the Abbey has Catholic origins, of course. Thank you Mira. Anytime you want directions for this area, just let me know. It's great that you have a viewing gallery high in the cathedral. That's excellent news. I'll visit it next time I go to London. I'll just remember Victoria Station :) Thanks for this! Westminster Abbey is more than 900 years old, but the cathedral is but nineteenth century. If you get the chance, do go. It has a really different feel from the Abbey. Thank you for reading it. I'd love to see this cathedral. I had it confused with Westminster Abbey. Anyway, I"m pinning this to my Catholic board.